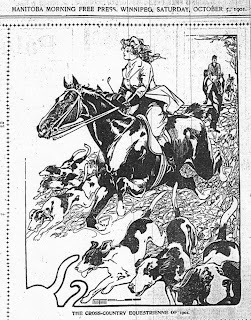 The first issue, which resembled a newspaper more than a journal, was dated December 3,1887, and featured serials, theatre, music, book reviews, society columns, jokes and gossip, but there was something new and important in it’s pages as well, single and multi-paneled caption cartoons. The cartoons were drawn from sources all over the world. Americans with luminous names like Opper, Kemble and A. B. Frost were most prominent, with material bought or borrowed from Puck, Judge, Life and Harpers’ Weekly. Cartoons from British newspapers and journals and the German Fliegende Blatter were published more infrequently. 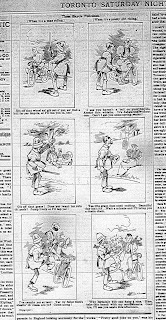 The June, 29, 1895 issue of TSN printed a four-panel caption strip, ‘The Dog’s Revenge’ in which a dog makes good use of firecrackers tied to his tail to light up a box full of fireworks and send them to explode on top of two urchin tormentors. Like the early American strips by Opper, the strip was printed vertically. The three characters moved thru the panels against a blank background and still the panels had depth and perspective. It was signed by C. E. Toles. Two Toles caption comics appeared in that issue and Toles kept the funny coming all through 1895. Toles was an American cartoonist and his cartoons originated in the New York Herald. His subjects were the topics of the day ; bicycles, bloomers, cops and bums. The strips, varying from 2, 3, 4, 5 and six panels, contained a population of Irish cops, Irish tramps, Irish cooks, comic ‘darkies’, newspaper vendors, telegraph urchins, cannibals and shoeshine boys. An officious cop berates passersby in ‘The Bicycle Policeman,’ a single-panel shows 4 tramps and a dog sitting on a wall under the caption ‘Real Roadside Flowers,’ the Climber Brothers from a circus rescue Nellie Golder from a third floor hotel fire by forming a human ladder in ‘A Thrilling Escape.’ Toles must have been enjoying himself hugely, each issue was filled with his cartoons. December 21, 1895 ‘Christmas Greetings’, a one-panel, pictured the bespectacled artist , one hand on his waist the other on his chin, bent forward, surrounded by a circle of his character types in bubbles, cops, bums, blacks and messenger boys. 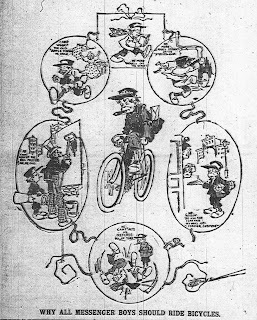 Single-panel cartoons by Toles and others also filled the paper’s empty spaces. Wherever there was a blank spot there was a Toles cartoon. He drew animals, pet parrots, alley dogs and hungry cats. Occasionally he drew comics with a jungle background. ’A Suggestion For the Next Bicycle Show’ (TSN) has an Englishman on a bicycle chased by cannibals, (one wearing a flour sack) while the one-panel ‘Football in Darkest Africa’ (TES) had an ostrich who plays football with a lion, tiger, kangaroo, camel, elephant, parrot, rhino, boa constrictor and monkey. Toles began a series of illustrations that were printed on the front cover. To that point photographs or paintings of well-known personages had the front page. Toles cartoons also appeared in the Toronto Evening Star which would later be responsible for the Canadian Star Weekly, a weekly magazine containing a comic supplement of American comic strips. To this date they had only printed one or two odd crude single-panels. Toles drew the first caption strip to appear in the paper. His first vertical caption strip was ‘Peeler Ike’s Reward’, January 9, 1896, in which a millionaire is robbed twice in 4 panels. Soon he was joined by Americans Archer, Lucas, W. M. Goodes, and C. A. David. David and Archer had been fellow caption-strippers for Toronto Saturday Night. His characters remained the same and again a bucketful of humour appeared until, fittingly, he drew the last cartoon in the Star, a one-panel cartoon featuring coloured people. No more would appear until 1905, when pages of Chips, Funny Wonder, Puck and Life cartoons appeared on humour pages, eventually giving way to the chromo platinum comic strips of Outcault, Dirks and Opper. Talented Toles produced a large amount of work in a very short period of time. During the 18 months from June, 29, 1895 to December 24, 1896 (the day of his last Toronto Evening Star cartoon) in at least two Toronto papers, a largely unknown and forgotten cartoonist filled every available space he came across with laughter and slapstick. I was curious if you had any more leads on the life or work of CE Toles. Yesterday, while researching issues of the Portland Oregonian newspaper from 1900 for a comic I'm working on, I happened upon multiple comics and illustrations by CE Toles and was fully intrigued. I found your post while searching for more about him. I will be posting some of the images I found on my website www.radrobot.org in the next day or so. I wish I did, Toles work appeared in almost every American and Canadian newspaper of the time and he remains a cipher. The only known fact is that his comics originated in the New York Herald. The New York Times obituaries are usually a good source for cartoonists lives and they never mentioned him. I'll look forward to seeing more Toles on your blog.